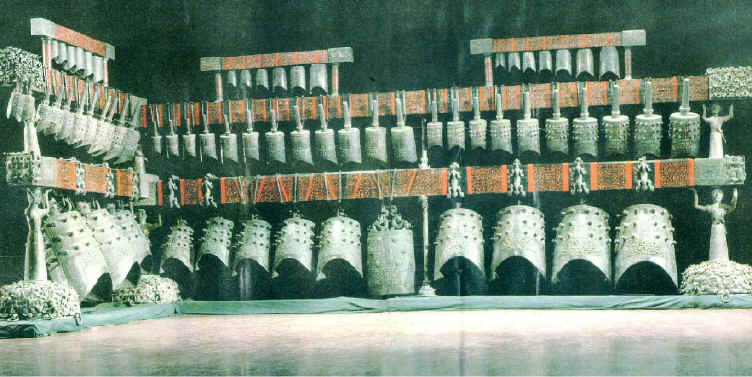 A unitary ensemble of 65 bells, with 130 discrete strike tones, was excavated in a fully preserved state 1978 in the Chinese province of Hubei from the tomb of the Marquis Yi of Zeng from 433 B.C. The ensemble's tuning system could now for the first time be determined by applying exclusively empirical methods. Only pitch data, hanging order, and tone names on the bells were considered. The results show (1) a norm tone of F4 ~ 345 Hz (ca. F4-20 Cent, re modern A4 = 440 Hz), (2) a six-tone standard scale of D-E-F-G-A-C with F#, G#, A#, B, C#, and D# as accidentals, and (3) a third-oriented tuning with equally tempered fifths (~696 Cent) in the series CGDAE. This picture shows the proportions between bells and musicians. In a real performance, the bell players must have been sitting or standing behind the bells, because they had to face the leader of the ensemble and the other musicians infront of the bells. One can assume 3-6 players for the 13 bass bells in the lower tier, 9 players for the 33 melody bells in the middle tier (one for each octave group), and 3 players for the 19 small bells in the upper tier (one per chime). Sound sample (mp3, 501 KB, 31 sec) from a test performance with the original bells, well demonstrating single-bell sounds but not orchestral ones. The 65 bronze bells from the tomb of Marquis Yi of Zeng (433 B.C.) are considered as one of the most fortunate discoveries in archeology. Due to favorable conditions of tomb preparation, soil, and soon natural water filling, the bronze of the bells survived fully intact. The bells sound as they did 2,436 years ago, and - as yet - better than any replicas that have been made in our days. Two-tone bells were common in China between 1200 and 200 B.C. After that the advanced know-how to cast them was lost, and it could not yet be fully recovered in our days. The bells have an eye-shaped cross-section and vibrate in one of two modes, depending on where they are struck. A strike in the middle of the front makes frontside and backside vibrate as whole units and produces the lower tone sui. A strike between the middle of the front and a side edge makes frontside and backside vibrate as two units each and produces the higher tone gu. If struck correctly, both tones are fully independent, each with its own fundamental and harmonics.This is shown in a spectral analysis, presented together with the underlying sound samples, of the two tones of one of the original bells. Quality and timbre of the two tones are fully compatible, and they are both marked by tone-name inscriptions on the bells. Thus, both were intended to be used in musical practice. Of the 33 bells in the melody section of the Zeng ensemble, 21 have a sui-gu interval of a minor third (mean 312.4 Cent, SD 13.8), 10 have one of a major third (mean 403.1 Cent, SD 18.1), and two have apparently mistuned ones with 244 and 342 Cent (details below). The tone names inscribed on the bells very clearly reflect a theory of scale generation by both fifths and thirds. It must be examined, however, if the actual tuning practice agrees with the theory. The results show that it does not. The tone name system obviously had lost its theoretical background for the bell casters (details below). But it is a very interesting name system, because it shows an awareness of the thirds in the concept of scale construction, something that developed in Europe ca. 2000 years later. As shown in the pictures above, all bells are united in one L-shaped suspension system. The 13 bass bells in the lower tier were possibly used for punctuation, like the gongs in gamelan music. The 19 small bells in the upper tier are tuned in deviating modes, and less accurately than the melody bells. They may have been used for special effects. The bells of the lower and upper tiers roughly match the 12-tone system of the 33 melody bells in the middle tier. But due to tuning deviations they can not have participated in a "tutti" sound, as performed by string instruments in a European orchestra, or by sarons and bonangs in a Gamelan orchestra. Analysis of the measured tone data shows that the 33 melody bells in the middle tier repeat the six-tone scale D-E-F-G-A-C eight times. In five of the eight cases, the scale exists as a subsection of just three adjacent bells that are part of one of the three sections of the middle tier with 11, 12, and 10 bells, respectively (see pictures). Each of the five three-bell groups provides the six tones DEFGAC due to the two-tone character of one bell: first bell D-F, second bell E-G, and third bell A-C. Because the bell sounds have short decay times - another accomplishment of the sophisticated bell shape - the availability of a complete octave scale in three adjacent bell allows very fast playing. The apparent order of octave repetition reveals a subdivision of the three bell rows of the middle tier into 9 groups of 3-5 bells each, as shown in the table below. One can assume that in some performance types there was a player for each of these 9 subgroups. That way it was possible to play eight-fold "tutti" melodies, very similarly as today with saron instruments in a Gamelan orchestra. Interestingly, the DEFGAC scale uses the same tones as the famous hexachord of Guido of Arezzo from the early 11th century A.C., which was the foundation of European music notation. The differences are that Guido's hexachord was (1) a purely relative pitch system with an interval structure of CDEFGA, and (2) unrelated to any norm tone, an invention that had little relevance in Europe before the 19th century. To my knowledge, the musical order of the 33 melody bells of the Zeng ensemble has never been published before. This shortcoming may have prevented a complete analysis of the bell's tuning system. As will be shown now, the DEFGAC scale was the missing key to what the bell casters had in mind. The European 12-tone system developed as one with 7 main tones (white keys) and 5 accidentals (black keys). The Zeng bells have 6 main tones and 6 accidentals. As shown in the table above, there is only one complete chromatic 12-tone scale (E4-E5 in set II). Three further octaves have four, three, and two accidentals, respectively. Thus, a wide range of melodic and harmonic variations was possible. It would be wrong, however, to call the Zeng bells a 12-tone instrument, like the piano and most other European fixed-key instruments. The accidentals had to remain accidentals, due to their small number, and also because they were less accurately tuned (see data tables part A). A norm tone is not essential in an orchestra. But if there is one, it can be useful in instrument production and in performance. A norm tone for the Zeng bells would also be a further key to the underlying tuning system. Because each of the tones DEFGAC is repeated eight or nine times in the 33 melody bells, there is a way to detect a possible norm tone among them by calculating the tuning variance within each tone class and then compare the results across tone classes. If one tone class has a statistically significant low tuning variance, it can be considered as the one that contains the norm tone of the system. The data show that F is the outstanding one. The result is significant on the 0.05 level (F-test, two-tailed, F=4.527, df1=39, df2=7). In other words, there is a probability of less than 5 % that the exceptionally low tuning variance in the tone class F is a chance result. The bells do not reveal directly in which octave the norm tone was. But they clearly show that the octave D4-D5 was the main one. It overlaps almost fully with the present international main octave of C4-C5 (c1-c2, in traditional European terms), and also with the main octave of Central Javanese Gamelan (CD4-CD5). This octave encompasses the major part of the pitch range of the voices of women and children, and it is also favored by the human auditory system (as reported here). All indicates that the bell casters had their norm tone in this octave, that is, close to F4 - 20 Cent relative to the modern A4 = 440 Hz (see data tables). The frequency of this tone is close to 345 Hz. The second tone of the scale that was generated from F obviously was D. It is the lowest tone in the scale, and the interval D-F is the one that is most precisely tuned in terms of physical harmony (frequency ratio 6:5 = 316 Cent, see data tables part B). The means of tuning data of DEGAC then show that from D two downward fifths generated G and C and two upward fifths generated A and E. Most interesting is that all of these four fifths are equally tempered with a size close to 696 Cent (data tables part A) and that this was done for the sake of improving the thirds. This finding was also confirmed statistically by comparing the data with five tuning models. Considering the fifths and the thirds in the scale DEFGAC, it is obvious that the tuning focus was on pure thirds, not on pure fifths. The awareness of pure thirds may have grown with the experience of the two-tone bells in the preceding centuries. The 65 Zeng bells prove that about 2500 years ago the Chinese had fifth generation, fifth temperament, a 12-tone system in musical practice (not just in theory), a norm tone for an orchestral ensemble, an integration of fifths and thirds in tuning, and a preference of pure thirds over pure fifths. 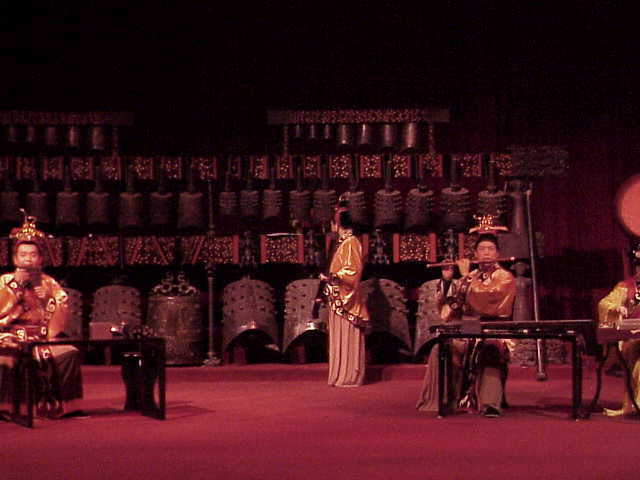 At this point in history, China was 2000 years ahead of Europe, not only in bell casting, but also in musical acoustics. One may hope that replicas of ancient Chinese bells that match the quality of the best originals can soon be made, and that appropriate mallets are used to play them. One may also hope that musicians will then make full use of the Gamelan-like potentials of large bell ensembles, as those from the Marquis Yi of Zeng. The bronze division of the Shanghai Museum: Laboratory measurements of the frequencies of Marquis Yi's set-bells of Zeng. A special issue of Collected Essays of the Shanghai Museum, Shanghai 1982, p. 89-92 (in Chinese). - Lothar von Falkenhausen, Suspended Music: Chime-Bells in the Culture of Bronze Age China. Berkeley and Los Angeles: University of California Press, 1993 [31 sample pages]. - Thomas D. Rossing, Science of Percussion Instruments, World Scientific, Singapore, 2000, Chapter 13: "Eastern Bells". - Shen, Sinyan, Acoustics of Ancient Chinese Bells, Scientific American, 256, 94 (1987).